GRAPHIC: Brenna Maloney and James Smallwood Washington Post. Can you spot something missing from this great image of the ear? Adapted from the National Institutes on Deafness and Other Communication Disorders website: http://www.nidcd.nih.gov/health/hearing/pages/noise.aspx Hearing depends on a series of events that change sound waves in the air into electrical signals. Our auditory nerve then carries these signals to the brain through a complex series of steps. 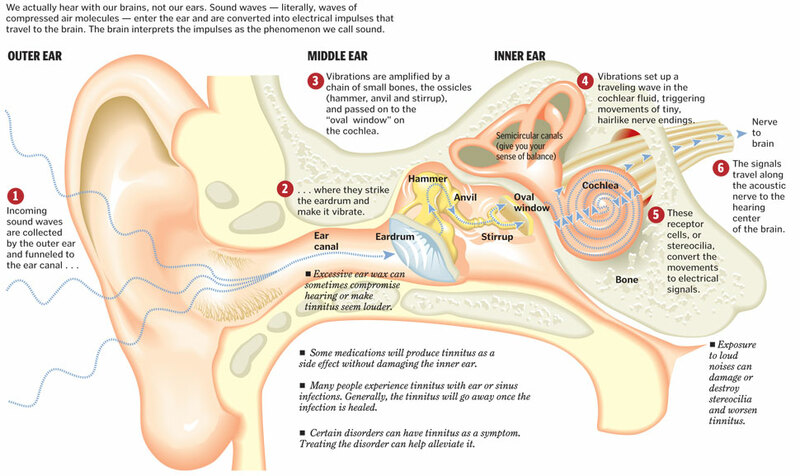 Sound waves enter the ear canal and add pressure to the tympanic membrane, the ear drum, causing it to vibrate. This vibration acts on the three bones behind the TM that pass on this vibration, amplifying the signal in the process. The TM and the bones of the middle ear,the malleus, incus, and stapes, are responsible for amplifying the signal. Sound is still just a mechanical signal at this stage. The bones in the middle ear amplify the sound vibrations and send them to oval window, a membrane on the inner ear. 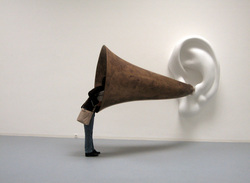 This sets off a series of vibrations in the jelly like fluid that fills the inner ear which continues into the cochlea. Within the cochlea there is an elastic membrane runs from the beginning to the end of the cochlea, splitting it into an upper and lower part. Hair cells with stereocilia are embedded into this membrane. The sound vibrations cause the fluid inside the cochlea to ripple, and a traveling wave forms along the basilar membrane which is stiffer at the lower end of the cochlea ( high pitched sounds) and gradual is more flexible at the apex ( low pitched sounds). This traveling wave causes the hair cells to move up and down as if 'riding a wave'. As the hair cells move up and down, their bristly stereocilia bump up against an overlying membrane and tilt to one side. This tilting action causes pore-like channels, which are on the surface of the bristles, to open up. When that happens, this stimulates an action potential, creating an electrical sign to travel down the auditory nerves to the brain. Original mechanical signal is now transduced into an electrical signal. Cochlear Implants this is only for hearing loss where hearing aids of any kind are not an option. This requires surgery and does allow for direct stimulation of the auditory portion of the brain- it bypasses the middle and cochlear portion of the inner ear and stimulates the auditory nerves directly. The link below is from a commercial manufacturer of cochlear implants and bone conducting hearing aids. 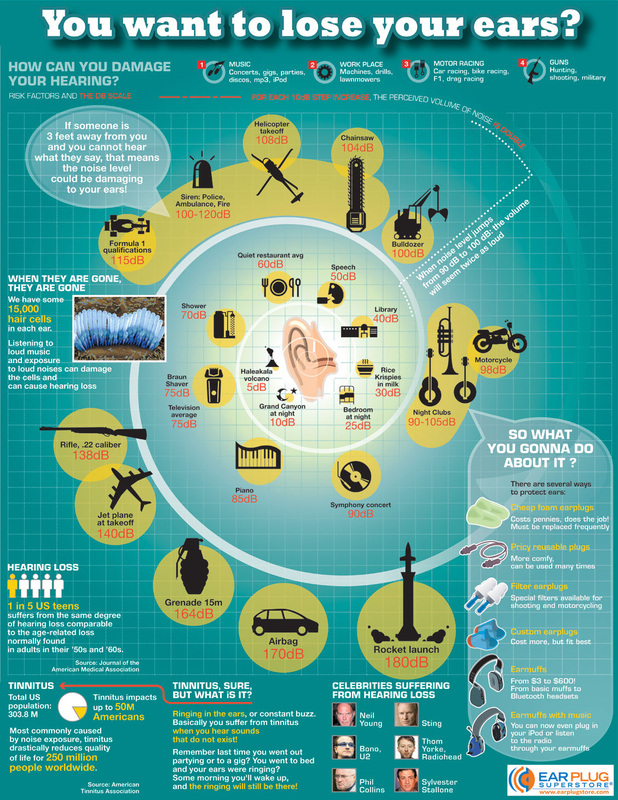 It is a very comprehensive description of the various types of hearing loss that can and do occur. Not all are as readily treatable as others and some are completely preventable- noise induced hearing loss being the easiest to prevent and sometimes the hardest to treat. Intact Inner ear hair cells are better at triggering sound signals that make sense in the brain than hearing aids trigger signals but the brain does not always separate out the sounds signals nearly as well with hearing aid amplified sounds. Tinnitus is NOT part of the IB Option but might be of interest to those of you who get this/have this. Great explanation for that not so funny ringing in the ears. http://www.washingtonpost.com/wp-dyn/content/graphic/2009/03/09/GR2009030902207.html?sid=ST2009030902347 and two youtubes that highlight the problem with the second giving a pretty good example of what tinnitus can sound like for some people. So what is too loud?